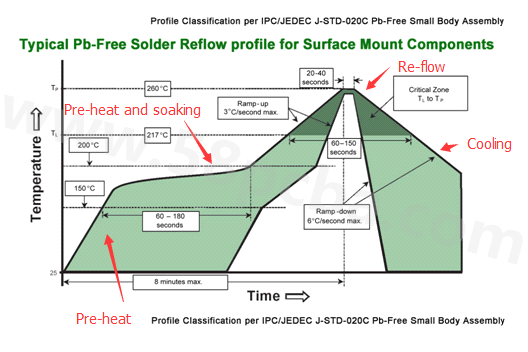 According to the recommendation by the IPC association, the generic Pb-free solder reflow profile is shown below. The GREEN area is the acceptable range for the whole reflow process. Does it mean that every spot in this GREEN area should fit your board reflow application? The answer is absolutely NO! The PCB thermal capacity is different according to the material type, thickness, copper weight and even the shape of the board. It is also quite different when the components absorb the heat to warm up. Big components may need more time to heat up than small ones. So, you must analyze your target board first before creating a unique reflow profile. ▪　Make an virtual reflow profile. A virtual reflow profile is based upon soldering theory, the recommended solder profile from the solder paste manufacturer, size, thickness, cooper weight, layers of the board and size, and the density of the components. ▪　Reflow the board and measure the real time thermal profile simultaneously. ▪　Check the solder joint quality, PCB and component status. ▪　Burn-in a test board with thermal shock and mechanical shock to check the board’s reliability. ▪　Compare real-time thermal data with the virtual profile. ▪　Adjust the parameter setup and test several times to find the upper limit and bottom line of the real-time reflow profile. ▪　Save optimized parameters as per the target board’s reflow specification. Previous：PCB Assembly: How to Maintain a Reflow Oven?